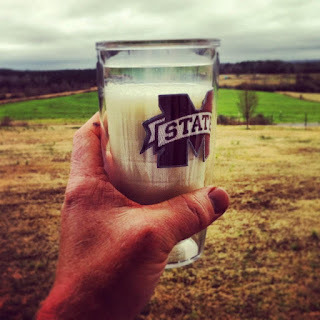 The Dairyman's Blog: Happy National Milk Day! 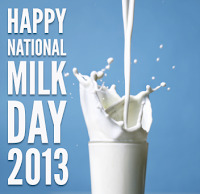 It's January 11th, which can only mean one thing: today is National Milk Day! Ok, I'll admit that I didn't have it circled on my calendar. In fact, I didn't even realize it until someone tweeted me about it after breakfast. Once I knew about it though, I felt it was my dairy farming duty to promote the heck out of it! I've posted a coupled of things about it on Facebook, solicited people to "#showmeyourglass" on Twitter, and now I'm cutting out my lunchtime nap to let you know about this great occasion here on my blog. How should you celebrate National Milk Day? Well, the obvious answer is to enjoy a glass of the good stuff. And by "the good stuff", I mean the REAL stuff...not that soy/almond/coconut/hemp nonsense. You can pour up a glass of "whole" milk, 2%, 1%, skim, lactose-free, chocolate, strawberry, or any number of other varieties available. You can also celebrate by cooking up something that calls for milk in the recipe, donating shelf-stable milk to your local food pantry, or expressing your appreciation to a dairy farmer you might know. I'd love to hear a story or see of photo of how you celebrated this great holiday! I hope you enjoy milk today and every day, both for its taste and nutritional benefits. 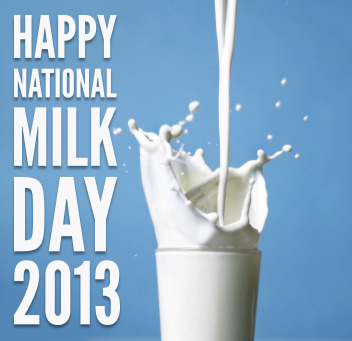 Most of all, I want to thank all of you milk drinkers and dairy lovers out there. It's because of your support that I get to raise my kids on a farm, work with my family, and do what I love to do every day. So I raise this tall, cold glass of milk in your honor...Happy National Milk Day, and Cheers!